According to student surveys and feedback, students lacked resources and direction to think constructively about long-term college and career choices. 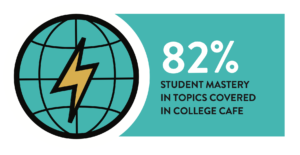 Students needed support to explore options for post-secondary pathways and proactively plan the necessary actions during high school to be college-ready. College Cafe is a space for 9th and 10th grade students to get inspired by mentor and alumni speakers and participate in post-secondary planning actions such as college and major exploration, and course planning. The College Cafe contributes to a college-going culture starting from the beginning of 9th grade. Students find comfort in a safe space and ask questions about their academic opportunities. They are authentic and thoughtful when reflecting on their personal why and best fit pathway after high school. Students speak positively of the College Cafe to other students, which increases attendance through trusted peer word of mouth. The Steinmetz High School design team built a college going culture starting in 9th grade through the new College Cafe. All Steinmetz students are urged to strive toward gaining admission to college, regardless of the intended choice for college or career after graduation. Many students lack the resources to plan for this transition. One common challenge is financial constraints that are often a barrier to admission that could be mitigated with additional, earlier student guidance. At Steinmetz, conversations about post-secondary options often started when students entered 11th grade. The school design team realized that this is too late in high school for all students to be set up for a successful college application process. The team aimed to make this goal attainable for all students by providing specific support to students in 9th and 10th grade through the College Cafe. The purpose of the College Cafe is to support students to begin to explore and plan their post-secondary pathway. 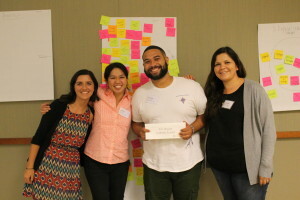 The school design team engaged in empathy actions with students and alumni to understand the barriers and opportunities for the college application process. The College Cafe is a space where facilitated sessions are o ered for 30 minutes twice each week during lunch for 9th graders and 10th graders respectively. The activities of the College Cafe sessions varied each week to keep engagement high and provide high quality content to students. Skill development sessions focused on the development of skills such as how to calculate your GPA, how to email a teacher or professor for help, and time management. Other sessions featured school alumni or speakers who shared stories and advice from their personal journeys to and through college. 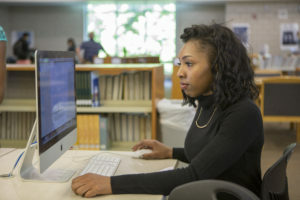 Some sessions provided flexible but structured research time for students to explore potential colleges, majors, and extracurricular activities. Overall, sessions aimed to help students identify what they need to accomplish in high school in order to move forward on their desired pathway. This year, students chose to attend the College Cafe when they wished to and were not required to attend. As the school design team expected, many of the students who attended were very driven and high performing academically. The team aimed to influence a target group of students who were medium or low performing academically and could particularly benefit from added support in order to stay on, or switch to, a path toward college. This cohort was somewhat successful but the school design team did not feel like they were reaching the students they most hoped to impact. Therefore, in the upcoming academic year all freshman students will take a seminar class on college readiness and planning. and mastery of topics covered in the College Cafe sessions. 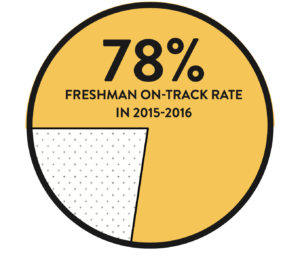 In the longer term, the school design team expects to see growth in the high school graduation rate, the percentage of students accepted to multiple colleges, and the percentage of students attending and persisting through college. They will track this long term data to understand enduring impact. Other new initiatives in the school such as college visits and student recognition programs together with the College Cafe contribute to this long-term goal. Based on learnings from the College Cafe this year, the Steinmetz school design team is creating a freshman seminar class for all 9th grade students. The team has built and leveraged excellent content for the class through design of the College Cafe curriculum this year. The seminar class will be a highly effective way to build the culture of college-going right from the beginning of the 9th grade year since all students will have this shared experience. Teachers in other subjects will be able to reference and reinforce the skill development through applications beyond the seminar class. To incorporate learnings from the College Cafe, the structure of the freshman seminar will be active for students, leverage technology, include the voices of many alumni and stakeholders, and make time for individual and small group conversations. In the 2016-2017 school year, the Steinmetz school design team will continue the efforts of the College Cafe through the freshman seminar class. The freshman seminar will build upon the learnings of the College Cafe and provide that experience of exploration, learning, and proactive planning to all 9th grade students. The school design team will adapt the learnings of this year’s 30-minute, twice weekly College Cafe to a full length, course for all students. In addition to the class, the Steinmetz design team identified the GPA tracker a powerful tool that they used with students in the College Cafe. Because GPA is only officially calculated twice a year at semester grades, this tracker give students the ability to enter their grades at any time in the school year and calculate GPA. This provides them insight on which subject areas may be negatively affecting their GPA and where they may need to reach out to the teacher to improve their grades. The team found that when students see how each grade affects GPA, it reminds them to strive for the best possible grade in all classes. They have expanded the use of this tool with all students. Steinmetz offers all students a personalized curriculum through three smaller learning communities: Truth, Justice and Law; Communication, Expression and Art; and Science, Math and Technology. Steinmetz serves 1452 students in 9-12 grade. Steinmetz serves 91% low-income students.